1 of 5 Heat oven to 350 degrees F. Place potatoes in a glass bowl or dish. Add 1/4 cup water; cover with plastic wrap, venting a side. Microwave on HIGH power for 5 minutes. 2 of 5 Melt butter in a 10-inch ovenproof nonstick skillet over medium heat. Add spinach and scallions; cook 4 minutes, until most of the liquid has evaporated. 3 of 5 In large bowl, whisk eggs, egg whites, salt, pepper and half the cheese. 4 of 5 Add red pepper and cooked potato to skillet; heat through. Add egg mixture to skillet and cook 7 minutes, until edge is just set; stir softer mixture in center halfway through cooking. 5 of 5 Remove skillet from heat and sprinkle with remaining cheese. Transfer to oven. Bake at 350 degrees F for 20 minutes or until set. Carefully remove from oven (handle will be hot). Divide in wedges. 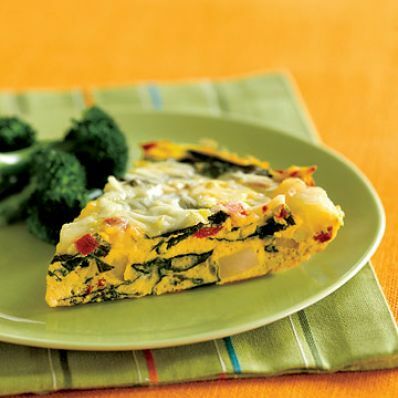 Serve with cooked broccoli.